David II was King of Scots for over 41 years, from 1329 until his death in 1371. He was the last male of the House of Bruce. Although David spent long periods in exile or captivity, he managed to resist English attempts to annex his kingdom, and left the monarchy in a strong position. Walter Stewart was the 6th hereditary High Steward of Scotland. 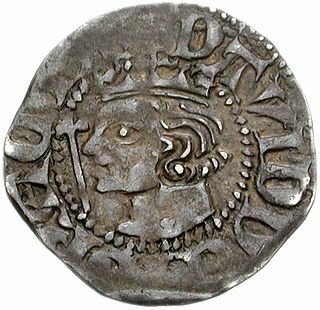 He was also the father of King Robert II of Scotland. 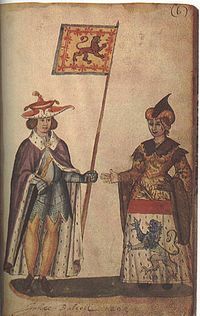 Dervorguilla of Galloway was a 'lady of substance' in 13th century Scotland, the wife from 1223 of John, 5th Baron de Balliol, and mother of John I, a future king of Scotland. Isabella de Warenne was Baroness of Bywell by her marriage to John Balliol; there is however doubt that she lived to become queen when he succeeded to the Scottish throne. Sir Ingram de Umfraville or d'Umfraville was a Scottish noble who played a particularly chequered role in the Wars of Scottish Independence. Alexander of Argyll, also known as Alexander of Lorne, and Alexander MacDougall, was a Scottish magnate from the late 13th and early 14th century. Sir William Oliphant, Lord of Aberdalgie and Dupplin, was a Scottish magnate, knight and leader during the Wars of Scottish Independence.